This thing is nice, it had a 486SX SMC soldered on, I put a DX in the expansion (I tried a DX2 and it didn't show anything on the screen, so I stuck with the DX). I have two PS/1s of nearly the same model, one year apart. One is in worse shape, broken power button, rust, and no cover. I cannibalized a few parts from that one to restore the other to working order with more original parts. It now has a 1.2MB floppy, 1.44MB floppy, and Maxtor 170MB HDD, all of these and the rest of it's parts (save the RAM) are IBM labeled. It has 24MB RAM across two SIMMs (2x36 and 4x36), and runs an original IBM-branded copy of Windows 3.1. I have two hard disks with the original IBM software for these disks, both 170MB, from the PS/1s. One had a much more blatant PS/1 logo at boot though, the older one, so I chose it for the machine. I'm using a Model M compact and one of the first handful of models of PS/2 mouse with it, as well as a newer IBM monitor from an Aptiva (it's all I have that's IBM and not black). I'll get pictures up in the next day or so, it's nice. You don't mention which model. From what you described it was perhaps a later Aptiva. One of the features of the true PS/1's was the Quadrature opening screen and the stub in the bios. It isn't an Aptiva, because it'dve said Aptiva on it. :P It says IBM PS/1, boots to Win3x and says IBM PS/1 real big, and has IBM PS/1 tools, software, and whatnot in Win3x. I'm pretty sure it's an IBM PS/1. lol! 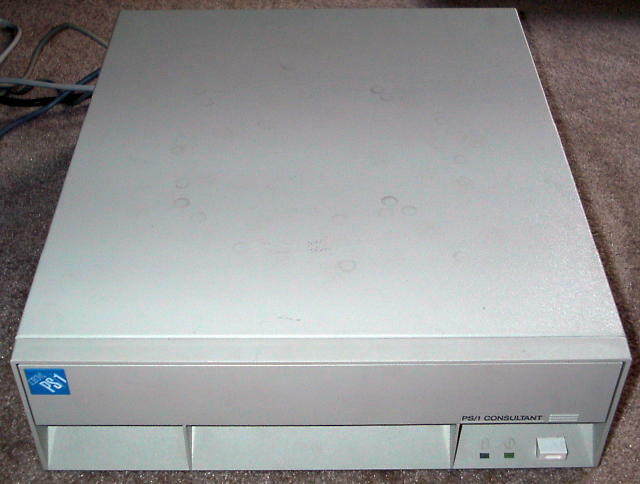 "Later" Aptiva makes no sense, as Aptivas were made until 1999, and this is a 1993 model of computer. I don't know what you mean by "Quadrature" opening screen, or BIOS stub. BIOS stub for what? It says "PS/1 Consultant" if that means anything to you, on the front. I'll post a model number if/when I get time to take the pictures too. Uh...what is THAT?! a 2155? * 2123 Limited production model. Based on IBM PS/2 model 30 case. * 2133 Desktop case. The 3x3 references the available slots and drive bays. * 2155 Desktop case larger than 2133. The 5x5 references the available slots and drive bays. * 2168 Tower unit. The 6x8 references the available slots and bays. Yeah I looked at that same page and assumed it was either a 2133 or 2155, The front panel with those little lines flaps down, revealing system info, an exposed 3.5" bay and an exposed 5.25" bay. There's another hidden 5.25" bay under that one. I'm gonna go look at it for a model number. Yep! It's a 2155-G52.. I take it this is a rarer one? I have two of 'em, but only one has the case, and both have slightly different mobos (diff RAM, one SMC proc one socket).. the one without the case is a year older, '92. The IBM PS/1 personal computer product line was renamed Aptiva in late 1994--PS/1 and Aptiva are essentially the same. Below are the North America machine types and models of PS/1s and Aptivas from 1991 to 1995. Information about the PS/1 is at http://ps-2.kev009.com:8081/pcpartne...stips/3ab6.htm; information about the Aptiva is at http://ps-2.kev009.com:8081/pcpartne...stips/ea3a.htm. Go to the technical specifications section to see specific model information. The "Quadrature" opening screen you mention is a graphics boot menu at startup that allowed users to easily select the PS/1's built-in software (see http://www.old-computers.com/MUSEUM/...=1&c=1274&st=1). This was on earlier IBM PS/1s--your later PS/1 would not have this. I collect vintage keyboards more avidly than perhaps anything else, what sort of keyboard would be found with this machine? Model M? I have an IBM XT Model F, IBM 84-key AT, IBM Model M PS/2, Model M Terminal, Model M Compact PS/2, Compact with separate numpad (unknown model type), a ~'95 black PS/2 IBM keyboard, and several from the Aptiva line and InfoWindow II terminals (all PS/2 connectors). IBM PS/1s came with the buckling spring model M2 keyboard (IBM ASM part number 1395300). The early Aptiva line usually came with the rubber dome model M2 keyboard (IBM ASM part number 73G4614). First I want to say hello to everyone. Nice place. I'm looking for information about my first PC, an IBM PS/1 that I purchased in Aug 1993. I cant remember exactly what became of it, I think maybe a lightning surge did it in. Amazingly I still have the original store receipt! Not alot of info as far as description goes other than an IBM G54. It had a 170 MB drive, 486SX-25, 4 MB RAM, and a .28 dot pitch monitor. I've bought a few PCs since then but I always wanted to find another one like my original. I found one on ebay a few years ago that I thought looked alot like my original PS/1. This was called the ADVISOR(model 2133A-46M). Same specs...basically same look, although I remember my original PS/1 being a bit "taller". I later came to realize that my original was actually called the CONSULTANT. From what I've read, Consultant had a model G54. Can anyone confirm that the Cunsultant did indeed sit a bit higher than the Advisor? I noticed Raven says he has the G52-2155. From what I see in his pic, his has a lower profile like the Advisor I later purchased. Maybe the G54 had the higher profile? Thanks. I pretty much lost interest in IBM consumer gear when the PS/1 systems arrived--they seemed too much like a retreat from MCA. Were they made under contract for IBM or actually by IBM?